This release is filled with planning, mapping, and navigation enhancements, including Flight Delay Notifications, Aeronautical Map Toggle, Trip Assistant, new Europe region, and more. 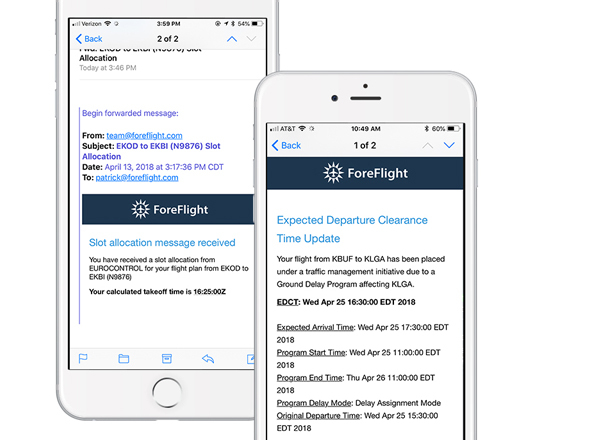 All customers who file US flight plans with ForeFlight will benefit by receiving Expect Departure Clearance Time (EDCT) notifications via email and push when any Traffic Management Initiatives are in effect. In addition, tap on expected route messages to load the modified route into Flights and automatically refresh the Navlog and Briefing. Customers who file Europe flight plans will similarly receive Calculated Take Off Time (CTOT) notifications. Traffic flow programs help to balance the airspace system capacity, and these notifications via ForeFlight provide the pilot or flight planner with critical real-time flight information. Instantly declutter the map by filtering airports, airspace, airways, ARTCC boundaries, terrain, and roads directly on the Aeronautical Map layer. 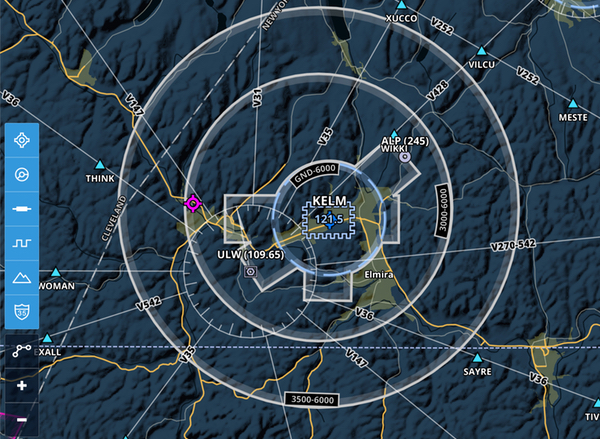 In addition, dynamic airspace altitude labels are now always visible along airspace boundaries. Trip Assistant helps any scheduler, executive assistant, or pilot more easily plan and prepare for upcoming flights. This simple-to-use tool factors in traffic during drive times, as well as flight times and time spent at each airport, to create a detailed itinerary so you know exactly when to leave or when you will arrive. Available on the web for Performance subscribers. ForeFlight’s Fuel planning feature now makes it easier to switch between fuel policies and update target values for faster scenario planning. Available with Performance plans. Graphical Route Advisor now supports user-defined minimum and maximum route altitudes to generate a more tailored Recommended Route. When planning European routes, you can also filter by IFR, YFR, and ZFR route types. Airport markers in the Synthetic Vision view are larger for better visibility, and you can single-tap on them to access detailed Airport information just like on the Aeronautical Map layer. Synthetic Vision is available for customers on Pro Plus or higher. 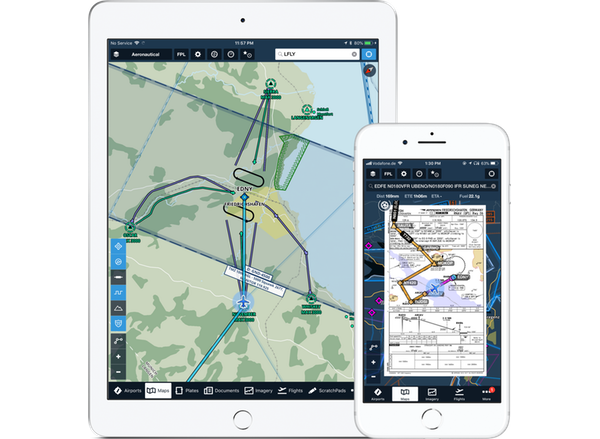 ForeFlight’s powerful features combined with Jeppesen’s world-class aeronautical data products give European pilots a comprehensive solution for charts, documents, weather, route planning, briefing, filing, and flying. 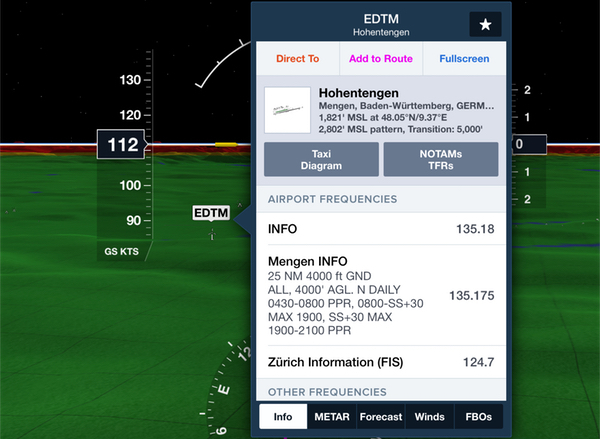 Beginning with a focus in the German market, ForeFlight supports both VFR and IFR flying in Europe. New Transition Altitude alert provides an audio and visual callout when you climb or descend through the transition altitude. The alert also includes the nearest altimeter setting on descent. Customers who fly with SiriusXM’s SXAR1 aviation weather receiver can now overlay a detailed Freezing Level layer on the map. Colored gradients depict the lowest altitude at which freezing and icing may occur across the continental U.S., southern Canada, and northern Mexico. Non-standard waypoint types like address/place searches, VOR-DME points, and location pins in User Map Layers now support “Add To Route” in addition to “Direct To” functionality, allowing you to incorporate them into your route just as you would a traditional waypoint or VOR. ForeFlight MFB customers can now access approved weather data from the 557th Weather Wing, the official weather source for the U.S. Air Force and Army, directly in ForeFlight. The newly-integrated weather source provides METAR and TAF data for hundreds of airports and bases in the U.S. and around the world.